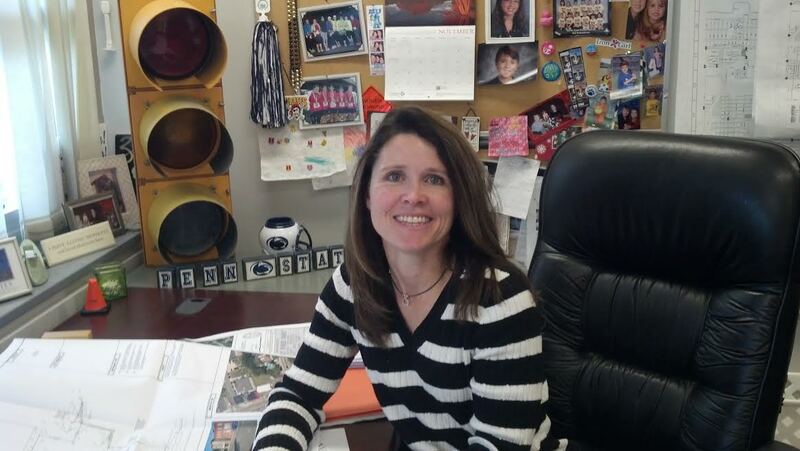 Tomorrow (Fri., Nov. 22) is Woman in Engineering (WIE) day at Penn State Behrend. This outreach program is designed to teach girls in 10th and 11th grade what an engineer does and what kinds of careers are available in the field. This year, a record 167 girls from 17 schools will participate in hands-on and interactive activities/workshops, many of which are taught by practicing female engineers from the Erie area. Parmenter has been the City of Erie’s traffic engineer for the past seven years. Q. What is civil engineering? What are your job duties? Traffic/transportation is just one sub-discipline of civil engineering. As the City’s traffic engineer, I am responsible for all operations relating to the traffic signals, lighting, signing, and marking. Q. What did you do before you came to Erie? I worked for the Maryland State Highway Administration and Howard County Public Works Department where I did intersection and interchange design and project management. After working in a larger city and coming back to Erie, I hoped I could make a difference and bring about some change that is needed. However, it all takes time and money. I’m confident we will get there…slowly but surely. Q. What do you enjoy about civil engineering? I enjoy the fact that you can design, advertise, and construct a project and feel a sense of accomplishment after your project is constructed. Q. What do you not enjoy about your job? Complaining. But when you work for a public agency, it comes with the territory. Q. What is it like to be a woman (a minority) in the field of engineering? As with many male dominated careers, you have to battle some bias from time to time. It’s better now than it used to be, but there are situations in which you have to be strong. You can’t be afraid to shake up a traditionally male mindset. Women bring a different perspective to the table and it’s important that be represented because, well, we do make up half the population. Q. When you were in engineering school, were you one of the only women in your major? There were probably only 10 other women in Civil Engineering at Penn State and fewer in my Master’s Program at University of Maryland. I’m not sure the numbers have changed much. Civil engineering isn’t the most glamorous of the engineering fields. Most of my career has been spent working with men in construction, inspection, police force, streets department, and engineering services. Q. As a girl, what appealed to you about engineering? I always enjoyed math and I had some encouraging teachers along the way. Q. Were you the kid taking apart toasters to see how they worked? (laughs) No, I didn’t take apart toasters, but my father worked in construction and I always enjoyed being part of a construction project. Q. Are people ever surprised to find out you’re an engineer? If so, why? Q. You’re a wife and mother (she and her husband, Jeff Seevers, have two children, Jenna, 10, and Jason, 11), has this been a career that worked for you as a mother? I have been lucky to have worked for employers that are supportive of my family life. I worked in Baltimore for 14 years, then moved back to North East after my daughter was born. I worked two days a week, flying from Buffalo to Baltimore for two years. Then, I started working part time for the City of Erie. They’ve been great. I will say that I gave up some earning potential in return for flexibility and more time with my children, but that’s something that many working mothers have to deal with, no matter what their career. Q. What advice do you have for young women considering a career in civil engineering? There are many facets of civil engineering (transportation, structural, geotechnical, environmental, and water resources). Try to expose yourself to all of those and get a broad knowledge base of each so that you can make an informed decision about what you would enjoy doing for the rest of your career. Engineering, in general, can be a very rewarding career path, but you should choose an area that really interests you. Q. What do you remember about your time here at Behrend? I loved my two years at Behrend. I had studied abroad in Japan during high school, so I wanted to stay close to home for college. Penn State Behrend gave me that opportunity. I live on campus for two years before I went to University Park. The friends I lived with in my freshman year at Behrend are still some of my closest friends today. And we are all very Penn State PROUD! Q. Are there any professors or classes you remember here at Behrend that stood out as being particularly helpful? I took most of my entry level engineering classes at Behrend with a smaller number of students than I would later see at University Park. It was nice to take these core classes in a smaller environment with professors that were accessible and helpful. I remember Dr. Lasher pretty well. Q. How can we get more girls interested in engineering? I think we need to encourage them to think big and let them know they can be anything they want to. I always hear, “engineering is difficult” or “math is hard” – well, yeah, it is, but instead of letting our girls off the hook, we should be challenging them. They can do it. Also, we need to expose them to the wonders of engineering and show them that it can be a really fun and exciting career path. That’s exactly what the Penn State Behrend’s School of Engineering plans to do on Friday.